I had some great feedback from author Mark Earls about the mindmap of his book “Welcome To The Creative Age” which I posted recently. It started me thinking about the importance of visual memory and I wondered if plotting a mindmap of a book’s chapters before reading would help the reader navigate through it. Perhaps publishers should start including mindmaps inside the covers? 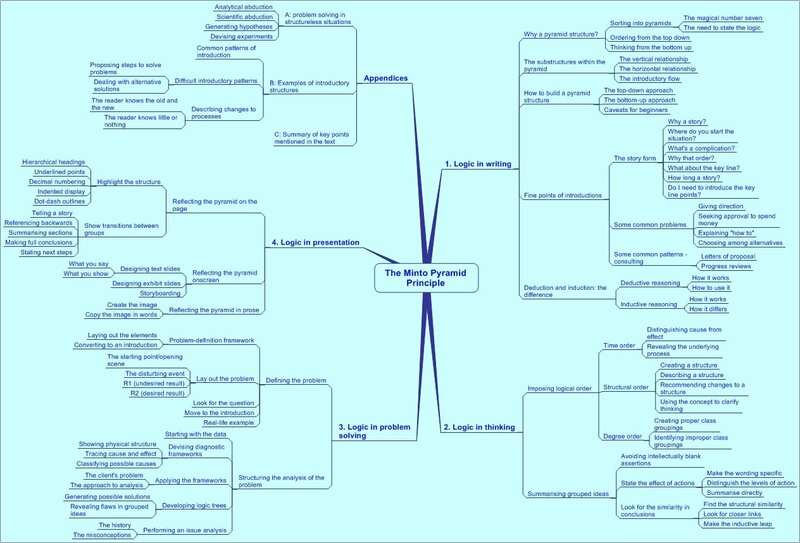 Anyway, I thought I should share some of the others I’ve made, so here’s my mindmap of Barbara Minto’s “The Pyramid Principle”, which I wrote about previously. Hi. Your mindmap of the pyramid principle is a great summary of a weighty topic. Any chance that I can have a copy of your mindmap source file so that I can use it in my learning about the principle? It is time to offer authors our services in Mind Mapping their books so that the fly leaf narrative goes away and a full blown mind map is the introduction to the book! Pingback: The Minto Pyramid Principle | Is This Wisdom?